The Best 2019 Real Estate Exam Prep You Will Ever Need… Guaranteed Or Its Free. Only $29! Pass your real estate Salesperson or Broker exam the first time guaranteed or this course is free. 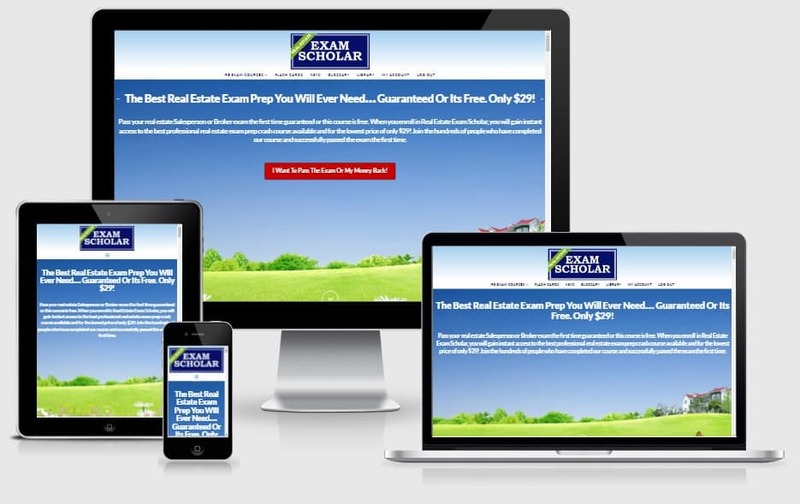 When you enroll in Real Estate Exam Scholar, you will gain instant access to the best professional real estate exam prep crash course available and for the lowest price of only $29! Join the thousands of people who have completed our course and successfully passed the exam the first time. I Want To Pass The Exam Or My Money Back! FREE GUIDE AND 50 QUESTION SAMPLE EXAM! Get our guide on “How To Pass The Real Estate Exam” and a 50 question sample exam (19 pages in total) for FREE simply by entering your email address below! Share this with anyone you know that could use Real Estate Exam Preparation at an extremely low cost! The Lowest Enrollment Fee Online! Similar real estate exam preparation courses charge anywhere from $49 to $200. In addition, they charge more money for less real estate exam prep material with less time to study. Don’t make the mistake of paying too much! Our enrollment fee is only $29 for the Salesperson Exam Prep Course. The course includes 6 full months of access to well over 1,000 questions with answer explanations, exam secrets, flash cards, full glossary, downloadable content, and much more. The course also includes our pass guarantee. Simply put, you will pass the exam on your first try or your money back. If you have questions about the courses, please contact us. This is top notch real estate exam prep at the lowest price anywhere. Don’t delay your success! Invest in your future now by clicking the button below. Start My Easy Enrollment Right Now! Want to try our Flash Cards for FREE? You can try our real estate exam prep Flash Cards for free by clicking the button below. These are a 10 card sample of the real estate exam prep Flash Cards that are in your enrolled members area. By signing up today, you will get the entire 700+ flash card database as well as the entire Salesperson or Broker course consisting of over 1,000 exam questions, a full glossary, a reference library, and much more. Try our Flash Cards below. Try the Flash Cards for FREE! We are so confident in the quality of our real estate exam prep program that we guarantee you will pass your real estate Salesperson or Broker exam or your money back! Our course is set up to allow you the most convenient and inexpensive way to study for the real estate Salesperson or Broker exam. Everything is structured so that you don't need to do extra work. Simply study and pass. Our pass rate is off the charts (in fact it is 98%!) but if for some reason you do not pass your real estate salesperson or broker exam on the first try after completing our course, you will receive a 100% refund within 24 hours. Simply set up your profile now and try our course today risk free. Enroll Now. Pass The Exam. Our real estate exam prep course works on any type of computing device you have. You can access it from your PC, Mac, iPad, iPhone, Samsung tablet, Android phone, Kindle Fire, etc. It will look and function great on any type of device. If you are visiting us from a mobile device, go ahead and turn your device sideways right now to see the effect. Use anywhere and anytime you need to study! Our online real estate exam prep course is available 24 hours a day and 7 days a week. Pick up right where you left off. Isn’t that great? Compared To Others…We Are The Best! See for yourself how our benefits are the best compared to similar online real estate examination preparation sites. We have done the research for you and compared our course with the top competitors in the online real estate exam prep field. Enroll now and enjoy the longest membership time, the easiest to use interface, the best learning tools, our pass guarantee, and the lowest price online! The main goal of our course is to get you to pass the exam. The secondary goal is to make it the least expensive out there because this business is expensive already. You don’t need more fees just to start. See the comparison chart below for only a few of the areas where we beat the real estate exam prep competition. Invest in your future now. Monthly Updates and NEW 2019 Updates! Includes: Unlimited access for 6 full months. Entire 1,000+ Salesperson Exam Questions with Explanations, Flashcards, Exam Secret Keys, FREE eBook, and course extras. Includes Pass Guarantee! Includes: Unlimited access for 6 full months. Entire 1,000+ Broker Exam Questions with Explanations, Flashcards, Exam Secret Keys, FREE eBook, and course extras. Includes Pass Guarantee! We Were Named as THE BEST Real Estate Practice Exam! We are helping a fast growing body of students prepare and pass the real estate Salesperson and Broker exam. We teach people like you how to pass the Salesperson and Broker exam everyday. Our real estate exam prep course has helped aspiring new agents and brokers all over the country to pass the difficult real estate exams. Over 50% of examinees fail when taking the exams. We guarantee you will pass the first time. Don't be one of the people who fail and pay another $60-$150 just to try again. Think of it as an investment in your future. Enroll now and be on the right side of success. It's risk free to try our course. This is the best exam preps I have taken. Now on to the last stretch to get my license. Yay! Thank you. Great questions this will definitely help me on my MO state portion. I have missed it by 1 — 2 times already. I feel better about my upcoming test. I purchased this course yesterday as a final ‘cram’ before my exam this morning. I passed on the first attempt–thank you! If you are on the fence about purchasing this. Go right ahead and know it WILL be the tool you use to pass your test. For $29 with a money back guarantee it is a no-brainer purchase. I started to study and felt lost, until I found this. Passed my exam first try. Very pleased with this program and it’s process of teaching you exactly what you need to know for the exam. I passed my online required course, but I was lost listening to videos about real estate. On March 11, 2018, I started your course. Initially, I was looking up quite a bit of the information to fill the huge gaps left from my flash cards and online course. By the end of eight days, I was passing all mock tests with closed book and ease. Yesterday, March 20th, I passed the Virginia State and National the FIRST TIME THROUGH. Great course. Much appreciated. So Why Do You Need Exam Prep, Anyway? The truth is, some people do not need any type of exam prep. You may be one of those people that can ace any test that is put in front of you without any studying. You might be able to remember all the facts and figures you read from a book. You would be what is called ``book smart``. This course may not be for you. This course helps those people that may need exam questions with easy to understand explanations, a more flexible way of studying, to build confidence before exam day, to discover weak areas, to hone their knowledge, or simply those that are serious about their license and truly want to pass the state exam and have a better future. There is a big difference between reading information from a book and actually having an experience of ``immersion``. By enrolling in our course, you will have that ``immersion`` experience and lose those jitters on exam day. While it may be possible for you to pass the exam by hard work without our course, by enrolling you will be sure to pass. We have organized everything for you in a convenient package to allow you to gain the advantage. So why do you need exam prep? So that you will pass when it matters most. Don't Delay! Invest in your Future with the Best Real Estate Exam Prep Course. Enroll today and get INSTANT ACCESS to our amazing Real Estate Salesperson or Broker Exam Prep Course! As an additional bonus, we are offering you a very valuable downloadable eBook on ``How to Sell Real Estate`` for FREE for a limited time. The guide will give you an inside look into what buyers and sellers look for and is yours to keep no matter what. It is our gift to you. Remember, the real estate exams are hard to pass and over 50% fail the first time. Not only that, but it is expensive to try again. This course has everything you need to pass the first time at a price that is unmatched. If you truly want to hurry up and pass the exam, enroll in our course right now. Enrollment takes less than 5 minutes and you will have instant access to the tools you need. Sign up below. Why Not? I'll Try It! There's Nothing To Lose. Have Questions? See our Frequently Asked Questions below. If your question about our real estate exam prep course is not covered, please fill out the contact form below and we will answer your specific question. Is it true I will pass the Real Estate Salesperson or Broker exam the first time guaranteed? Yes. We offer a pass guarantee or your money back. The full terms can be seen by clicking here. If you complete our course and then sit for the exam within 30 days of finishing our course and don't pass for any reason, you will receive a full 100% refund after sending us your failure notice within 30 days of actual exam failure. Is this course for the Salesperson exam or the Broker exam? This course covers the Salesperson exam or Broker exam. In some states you are considered a "Broker" as a sales agent working under a managing broker and is equivalent. By enrolling in this course you will have all the information you need for either exam. We do offer a specific California Broker exam due to the style of exam in this state. How long does it take to complete your course? What is the suggested time for completion? The short answer is: it depends. We have had people take as little as two days to complete the course, while in contrast, we have also had people take as long as six months and then ask for more time to complete it. It really depends on your level of competence with the materials. We suggest giving yourself two to four weeks to study the materials and complete our course. This ensures that you have enough time to actually learn the material well enough to pass. You can take longer or shorter if you wish. It really depends on how well you can retain information. Do I need to have already taken the three required real estate classes to take this course? No. You do not need to have already taken any prerequisites for our courses, however it is highly recommended that anyone that takes our courses has already taken the steps necessary to take either the salesperson or broker state exam. The state requires every real estate salesperson to take three specific classes to even qualify to take the exam (unless you are already a member of the state BAR). This course works best for those people that have already taken the necessary steps required to take either exam. This course includes material that should be review for most examinees and is meant to strengthen your chances of success. If you still need to take your required classes, you can conveniently take them online with our partner here. Is the $29 or $39 payment a one time payment or are there more charges? The $29 or $39 payment is a one-time charge that allows you access to the Salesperson course (or $39 for the California Broker course) for 6 full months. There are no other fees whatsoever in any way, shape, or form. You will never have to pay more than the one time $29 (or $39 for the California Broker course) fee. Access to the course is instantaneous after payment. You will automatically be directed to the course area and you can view anything you wish. You can then study as your time permits and log in and out as you please. Yes and No. The structure of most of the tests on our site are not timed. We feel that it promotes learning in a more relaxed way without a timer. However, the actual state exams are timed and we do have a timer for some of the final mock exams in our course. This promotes the exams as being more realistic to the real thing so you will not feel as anxious on exam day. Is each question graded instantly? No. Our exams work by showing one question at a time that you will answer to the best of your ability. Then, once you have answered all the questions in the particular quiz or exam, you will submit your quiz or exam and at that point all the questions will be instantly graded. This is done in this way to simulate the state exam environment. As a bonus, you will have the option of downloading or printing your results for further review. Do you offer the three classes or unit hours for becoming a real estate agent? Yes! Through our trusted partner, the #1 ranked online real estate school Career WebSchool, you can easily complete your required classes. Simply click here to be directed to our partner site and start completing your requirements with the highest quality classes, the lowest cost, and conveniently self-paced. Yes. Our site is secured with the latest technology to prevent any malware or private information from being shared. All credit card data is securely processed by our third party credit card processor STRIPE and is fully encrypted. We never see or have access to any credit card data. We are fully PCI compliant. Do you sell any personal information? No. We never use any information from you on our site for any reason except personal communication between you and us via your email address you provide upon sign up. We only use your email address to communicate course changes, questions and answers, or general inquiries. We never spam. Do you send me any course materials in the mail? No. Our course is designed specifically to be able to be accessed anywhere you have internet access and is entirely online. We do not have paper versions of our course. You can access our course from any device and learn at your convenience. If you prefer the pen-and-paper method, we recommend printing out portions of our course for further study. Depending on your printer settings, formatting may be required to allow nice looking pages. Can I print out the flashcards? No. Our flashcard system is a digital system that only works from a computer device. We specifically designed it to work with mobile devices as well, so it is like have a stack of flashcards in your hand with the convenience of mobile design! How many practice exams are in the course? There are 25 practice exams in the salesperson course that include over 1,000 exam questions written by real estate professionals with explanations. Each exam is graded instantly and your grades are emailed to you immediately afterwards. There is also a mock final exam that simulates the actual Real Estate exam that is timed and has 100-250 randomly selected questions depending on your state. Since the actual Real Estate exam has under 250 questions (some much less depending on your state), by passing our course, you will be sure to know the answers to the actual exam. For the California Broker Exam, there is 25 practice exams with material specific to brokers. Can I just skip ahead to the end and take the Final Mock Exams? No. Our course has certain practice tests that are "blocking", meaning you will need to score a particular minimum score before the next test will be unlocked. We purposely designed our course this way to help ensure that you will learn the necessary material you need before exam day. If you are simply looking for a quick way to cram, this course is not for you. This course is for those that are serious about their future and obtaining their license. What's the catch? Is this credible? There is no catch. Our site is designed in a way to let you pass the state exam. It simply does what we say it does, and if it doesn't work for you we will give you your money back. All the information and subject matter is what you will see on a state exam. Go ahead and try it to see the value we provide. Does this course cover both the State and National portions? Yes. Our course covers both the state and national portions of the exams in every state in a unique way to enable passing the actual exams. By taking our course you will be presented with all the information you will need to pass the first time. I already have a license in another state and do not need the national portion. Do you have a state specific course for each state that includes only state specific questions? No. At this time our course is meant for those that need to pass both the state and national portions, so you will see both styles of questions presented. We do not have a state specific course that includes only state specific questions at this time. Our courses cover both state and national material. We are considering bringing these types of courses to the market in the future. It is now 2019. Have you updated the course? Yes. We have reviewed all new guidelines and laws known to us and reflected this in our course material. Additionally, our course material is updated each month as needed. You can rest assured that you are getting the best Real Estate exam material available. Still Need The Required Classes? Our real estate exam prep course is guaranteed to work for those who are ready to take the exam. But what if you don't have the required classes finished yet? Simple! Real Estate Exam Scholar is partnering with Career WebSchool to offer online real estate courses. Enroll with our trusted partner and get your required courses finished online! Career WebSchool is the #1 online real estate school in the country with high quality courses, self-paced learning, live webinars, and the lowest cost online. If you need to complete your requirements, there's no better way. Once you are done with your required courses, come back and use our course for the final touch and pass the real estate exam! Simply click below to be directed to our partner site and select your courses. Want A Job In Real Estate? With our partnership with ZipRecruiter, finding a job in the real estate industry is now just a click away! Whether you are looking to be an agent, executive assistant, leasing consultant, or more...you can use our site to find your next paycheck in real estate for free. Easily find your ideal job opportunity in real estate near you by viewing our curated listings. Click the button below to easily see open positions within 25 miles of where you live. Yes Please! Show Me The Jobs! We understand that there are many competitors out there in the real estate exam prep world, but we are confident in our course. We understand that your money is valuable and can be hard to come by. We are happy to answer any questions you may have and we answer every email within 24 hours. Use the contact form with any questions or concerns or simply for more information about our outstanding real estate exam prep courses. 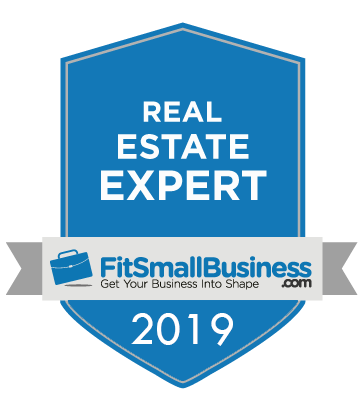 We were named as THE BEST Real Estate Exam Prep by Fit Small Business! Enter your email address below to get our guide on "How To Pass The Real Estate Exam" along with a 50 question sample exam (17 pages!) for FREE! FREE Guide and 50 Question Exam! Get our guide on "How To Pass The Real Estate Exam" and a 50 question sample exam (19 pages in total) for FREE simply by entering your email address below!